Our thoughts remain with Dawn Sturgess’s family, the other victims who fell seriously ill and the people of Salisbury who have shown tremendous resilience throughout. We are determined to bring to justice those responsible for Dawn’s death and Charlie Rowley’s poisoning, as well as the attack on Yulia and Sergei Skripal and Detective Sergeant Nick Bailey. A year on from the attack on Yulia and Sergei Skripal in Salisbury, there are parts of the picture that we are continuing to piece together, and I am urging anyone who has information that they have not yet passed to police to do so. I am conscious someone may have information but is worried about telling us a year on. Please do not worry – just call or email us. The information you have could be crucial to securing the prosecution of those responsible for Dawn Sturgess’ death. In particular, we are keen to hear from anyone who may have seen the counterfeit ‘Nina Ricci’ perfume box or bottle that was recovered from Charlie Rowley’s address in July. Did you see this pink box or glass bottle during that time? Do you have any information about where it might have been discarded? Any extra information from the public will be extremely welcome and may assist this highly complex investigation. Around 250 detectives from across the Counter Terrorism Policing Network have worked on the investigation into the attack on the Skripals and poisoning of Dawn Sturgess and Charlie Rowley. They have collected over 11,000 hours of CCTV footage; seized 3,700 exhibits and taken 1,702 statements in relation to the two incidents and continue to pursue a number of lines of enquiry. Brand new footage of the suspects involved in the Salisbury attack has been revealed as appeals for information continue. Service as Alexander Petrov and Ruslan Boshirov. the UK between Friday 2 March and Sunday 4 March? UK Counter Terrorism Policing announced a major update, Wednesday 5 September, in relation to the Salisbury & Amesbury Investigation. The Crown Prosecution Service has received sufficient evidence to authorise charges against two suspects including attempted murder of Sergei Skripal; conspiracy to murder Sergei Skripal, Yulia Skripal and Nick Bailey; use of a chemical weapon; and causing grievous bodily harm to Yulia Skripal and Nick Bailey. Assistant Commissioner Neil Basu, Head of UK Counter Terrorism Policing, outlined the evidence the police investigation had produced. 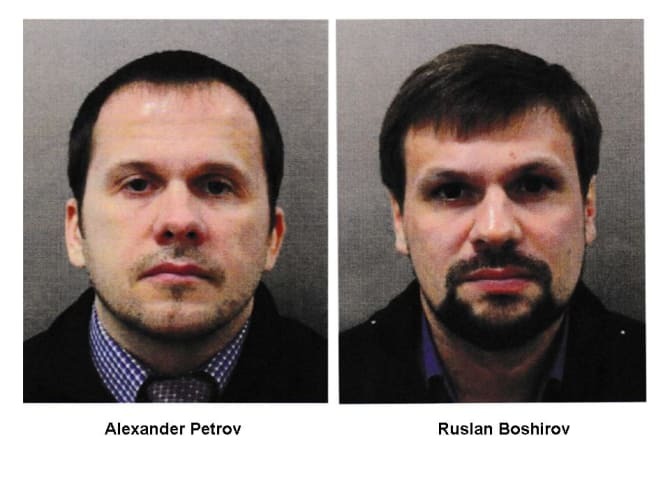 The investigation tracked two suspects as they enter the UK, arriving at London Gatwick Airport on a flight from Moscow, Russia on Friday 2 March 2018. They then travelled via public transport to a hotel in Bow Road, London where they stayed overnight. On Saturday 3 March, the suspects travelled from London Waterloo station to Salisbury. It is believed the suspects carried out reconnaissance before returning to London. The following day, Sunday 4 March, the suspects again travelled to Salisbury, and CCTV images identify them at key locations around the city. It is during this visit that it is believed the suspects carried out the attack, before they returned to London, travelled to London Heathrow Airport and returned to Moscow, Russia. 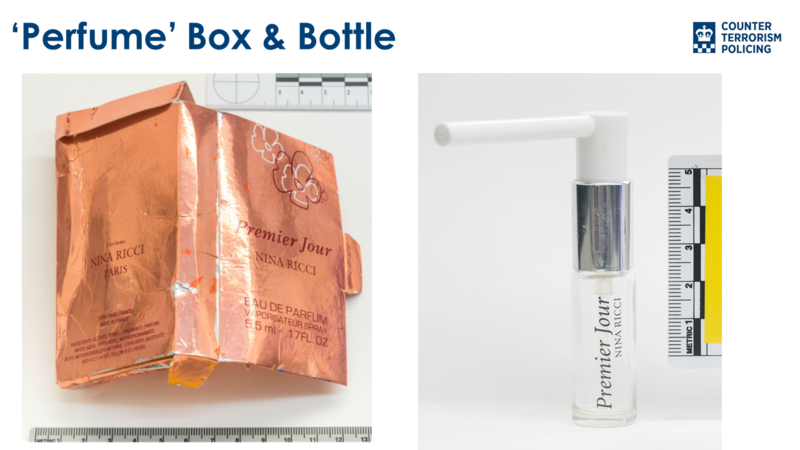 Images of the ‘perfume’ box, bottle and applicator that were found in Charlie Rowley’s flat have been released. The investigation team would like to hear from anyone who saw the items between Sunday 4 March and Wednesday 27 June. Assistant Commissioner Neil Basu, UK Counter Terrorism Policing Lead, provided a detailed update on the Salisbury & Amesbury Investigation on 5 September 2018. You can download the full statement, as delivered by Neil Basu. The statement is also available in Russian. Sue Hemming, Director of Legal Services, Crown Prosecution Service, provided an update on the Salisbury & Amesbury Investigation and announced charges brought against the suspects on 5 September 2018. You can also download the full statement, as delivered by Sue Hemming. Professor Dame Sally Davies, Chief Medical Officer, provided an update on the Salisbury & Amesbury Investigation and offered reassurance and advice on 5 September 2018. You can download the full statement, as delivered by Dame Sally Davies.